Finish the finishing, please. I always have a pile of handwovens that need finishing. Don’t you? The finishing smorgasbord includes repairing skipped threads (unintentional floats), securing ends, fringe treatments, hemming, wet finishing, pressing, adding hanging tabs, embellishments, and more. You know you are finally finished when your handiwork is being used and enjoyed. 1. 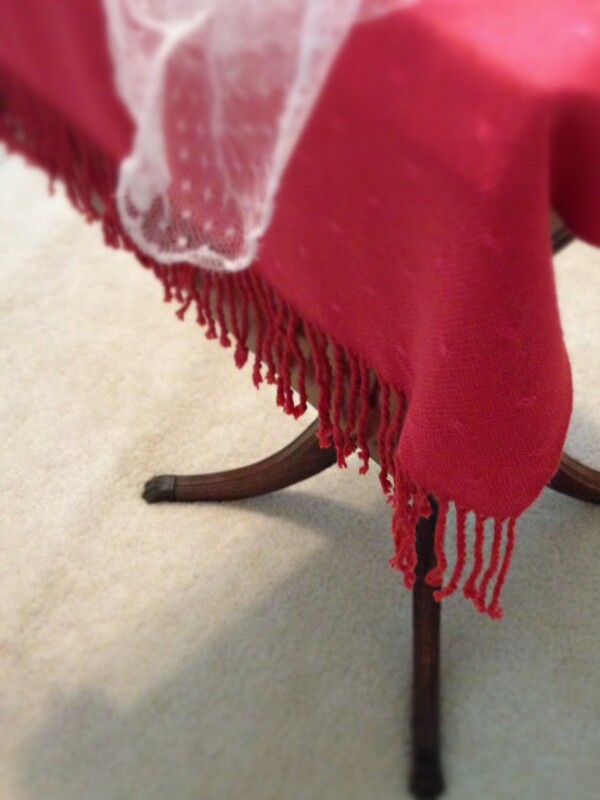 Twisted fringe on bamboo huck lace small tablecloth. 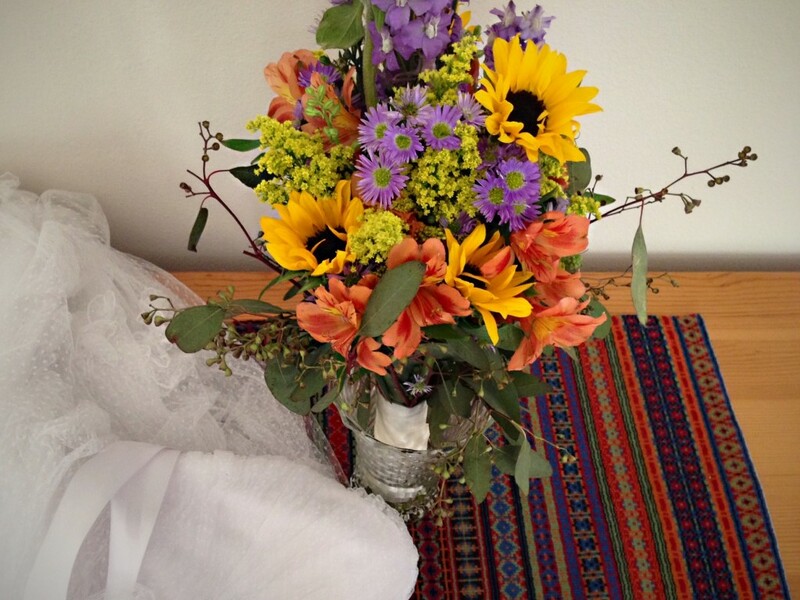 This cloth covered an heirloom table, becoming the altar, at Melody’s wedding. (This short piece was at the end of the warp after weaving two shawls.) You can see the shawls HERE, and twisting the fringe HERE. Twisted fringe gives an elegant finishing touch to this small huck lace table covering. 2. Added hanging tabs to handtowels. Installed Ikea rod with basket and hooks to hang handwoven handtowels in the powder room. (When you need tabs for towels, it helps to have a collection of inkle and band loom bands.) You can see the most recent towels HERE – I kept one of the eight for myself; the rest became gifts. 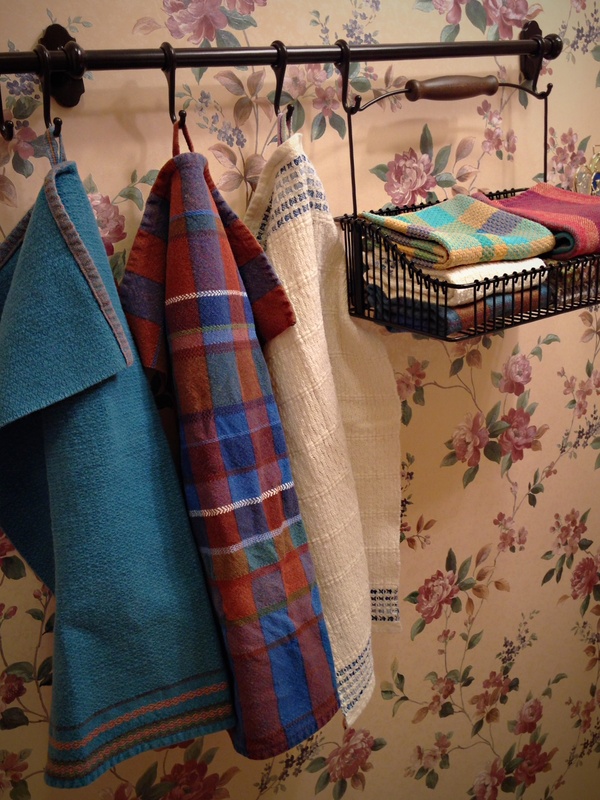 Ikea basket and hooks hold assortment of handwoven towels for guests to use in the powder room. 3. 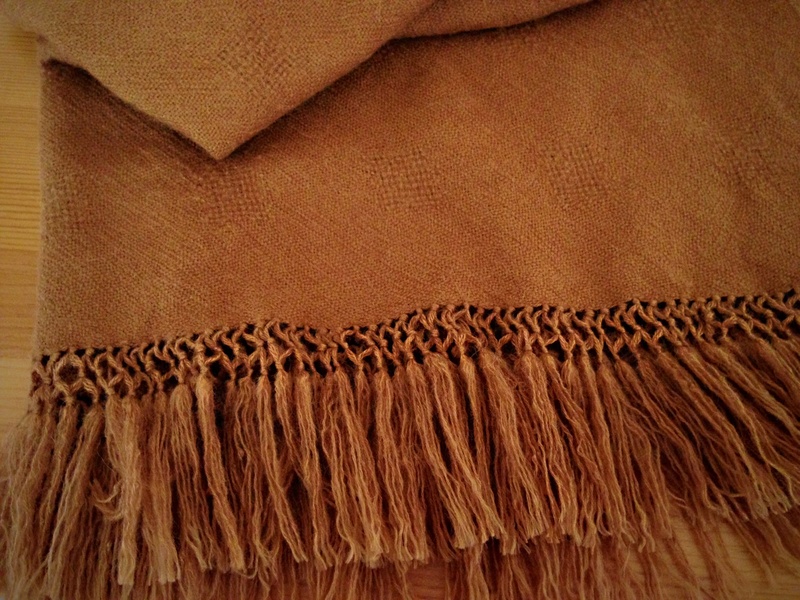 Untangled the fringe of alpaca/tencel throw. (A wet finishing nightmare I don’t care to repeat.) You can see what it looked like before washing HERE. Each strand of fringe was carefully separated one-by-one after leaving the alpaca/tencel throw in the washing machine a few minutes too long. Untangling took longer than tying the lattice fringe. Hours and hours. 4. 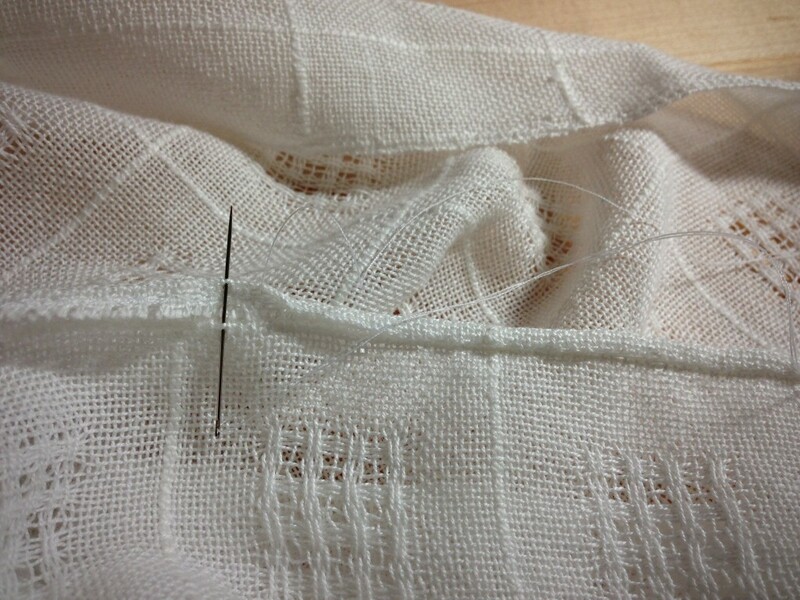 Hand-stitched rolled hem on Swedish lace tablecloth. (I may use this as a curtain for my weaving studio window, hung on rings with clips, on a rod.) 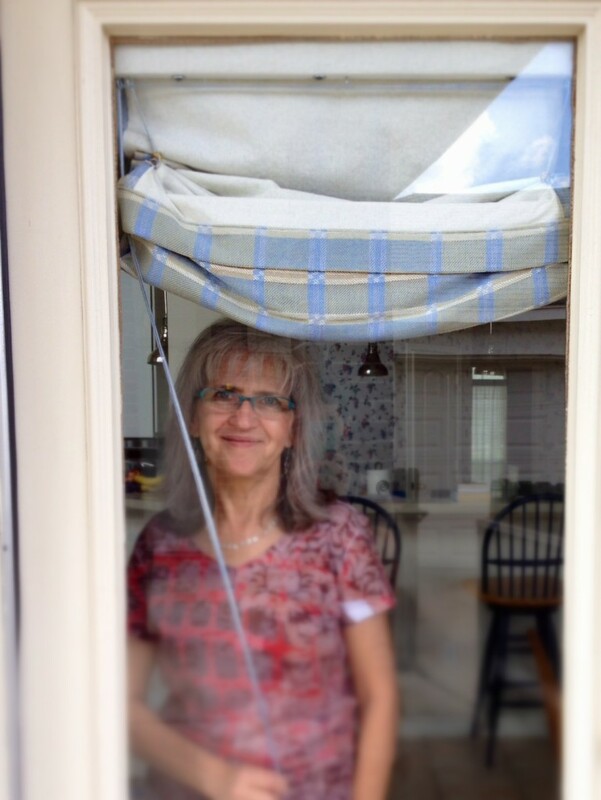 HERE are the long curtain panels that hang on windows in my home. 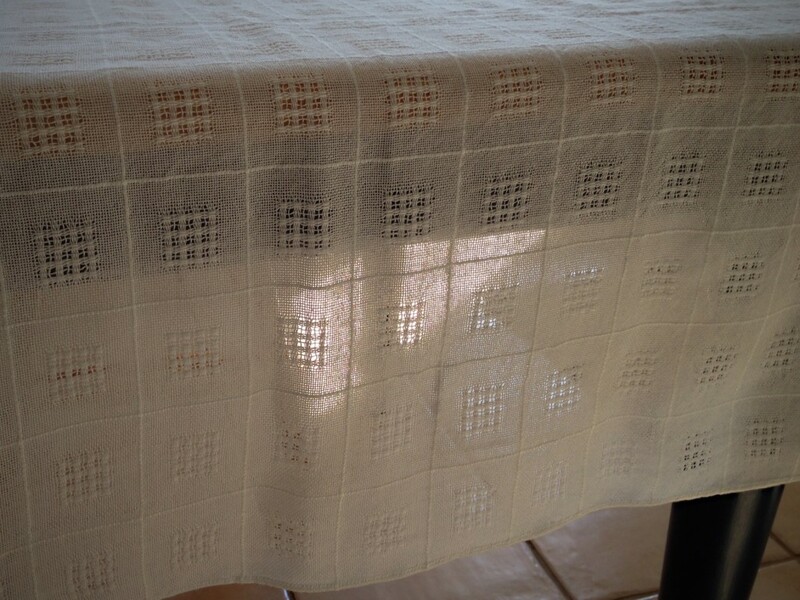 Swedish lace panel can be used as a tablecloth, or a curtain, or even a light, summery shawl. The hand-stitched rolled hem gives a delicate touch to this elegant piece. Swedish lace is shown to its best advantage when light is allowed to shine through the cloth. The pressed rolled hem adds a classy touch. 5. Hemmed small sample piece to carry around with me when I have a cup of coffee. (I grab this re-usable “scrap” instead of a paper napkin or paper towel. It also doubles as a coaster wherever I happen to sit down.) The original M’s and O’s towels are HERE; and HERE you can see what I mean about carrying my coffee cup around with me. 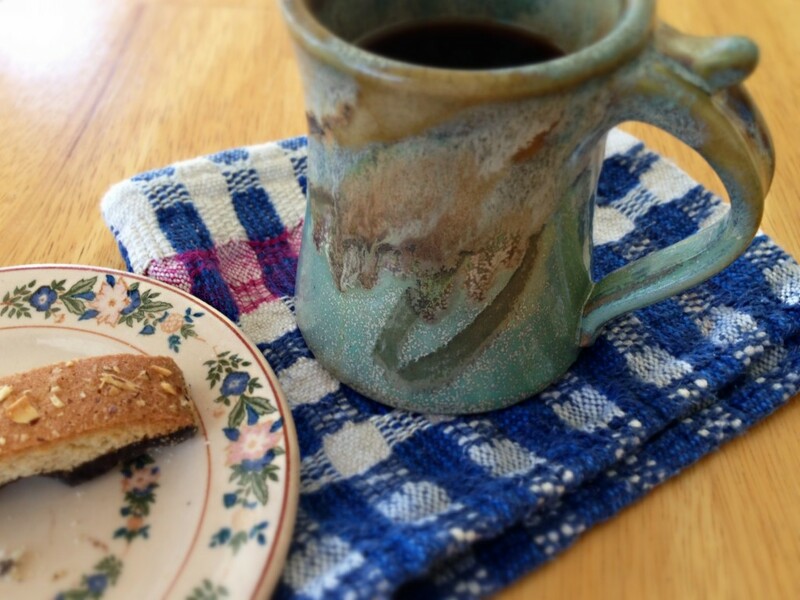 Scrap of handwoven fabric, from a cottolin warp of handtowels, follows my favorite coffee cup around. Linen and cotton threads that match the handwoven Roman shades were used to weave the pull cord. Cord woven on Glimakra two-treadle band loom. 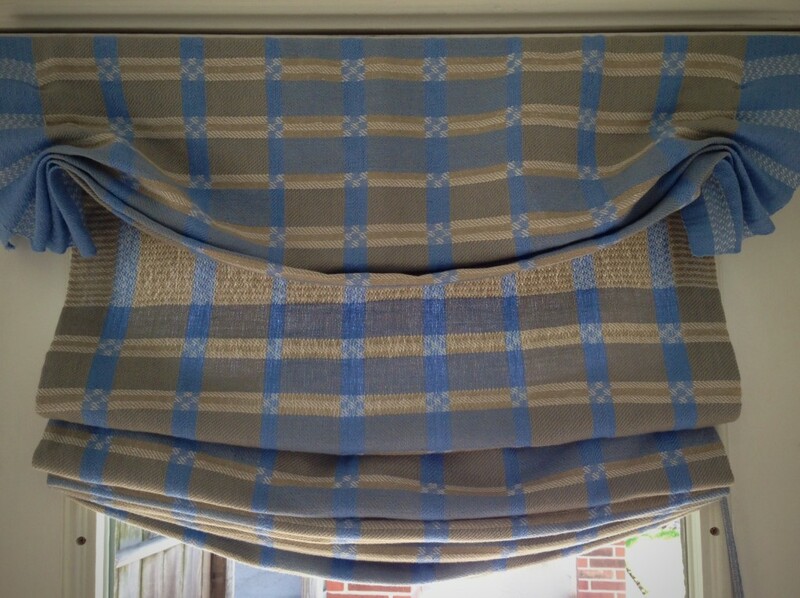 Handwoven Roman shades finally have a matching pull cord. 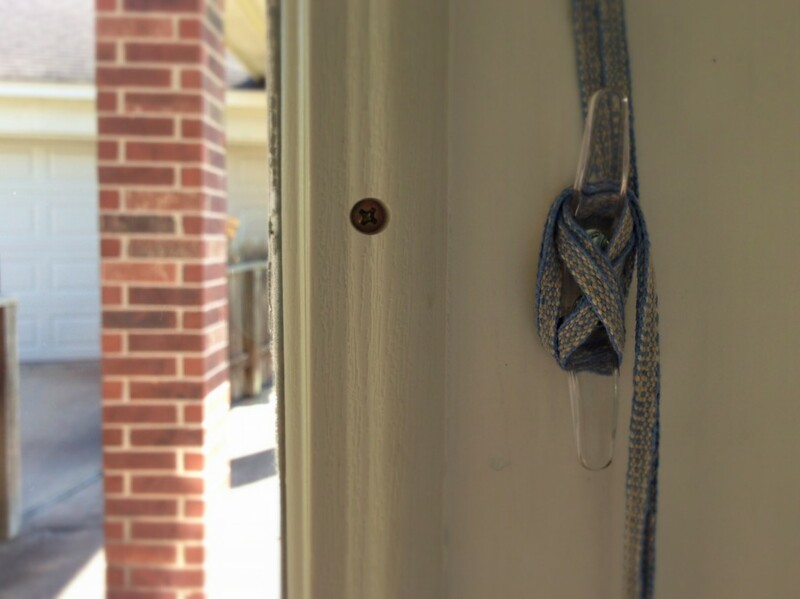 When the shades are lowered at night, the two-block twill structure is seen covering the whole kitchen door window. Woven on 8-shaft Glimakra Standard loom. Opening the shades to start the day and welcome you. Please come in! May you reduce your finishing pile (I know you have one). Gracias por compartir tus conocimiento. Es muy enriquecedor ver tus trabajos..
Hace pocos meses que he comenzado con un telar de peine Maria. de 90 cm y me da un poco de miedo invertir en un telar de 4 peines porque no se si podre dominarlo. I am happy that you enjoy weaving! 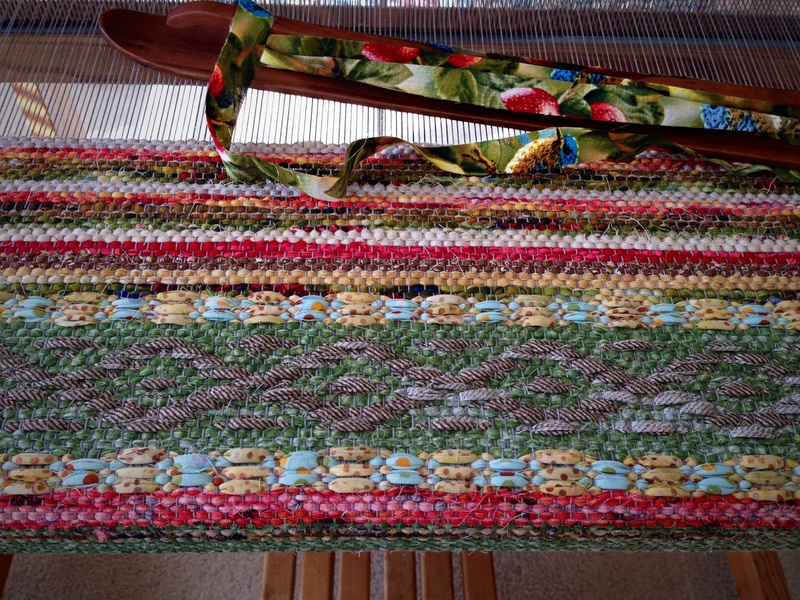 I have a 36-inch rigid heddle loom similar to yours that I used for many years. Weaving on your Maria loom is very good practice for weaving on a floor loom with 4 shafts. I hope you get to try weaving on 4 shafts. I know you can do it! 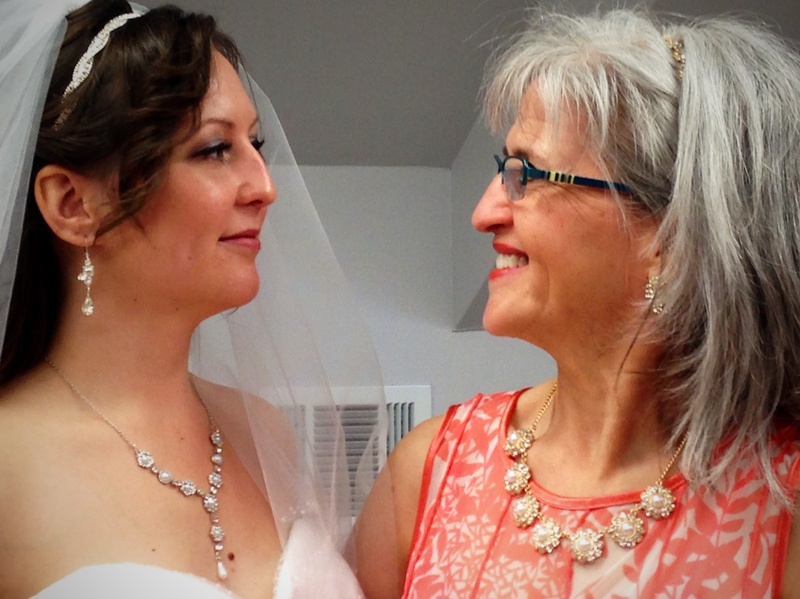 I’m thrilled to hear you love the Swedish lace! You are absolutely right – the Swedish lace is perfect for curtains. The tablecoth is an extra piece; I wove curtains first, at my husband’s request. We enjoy looking through the Swedish lace every day. Brown rosepath design stands out because of contrasting light background. The print and teal pattern that borders the rosepath design brings in some of the color from the plain weave hem area. Hold on to good. Let the virtue of goodness be a guiding star for decisions, behavior, and interactions with people. When our actions do not match that good ideal, it’s time to walk away from poor behavior and start over. We become zealous about other things, like good color combinations and perfect selvedges. (HERE is one of the best ways to improve selvedges.) Why not be zealous for good? I don’t mean pointing fingers at others. My own life is the only one I can inspect to see how it aligns with the ideal. The good idea is confirmed as the colors of gentleness and respect are noticeably woven into the fabric. 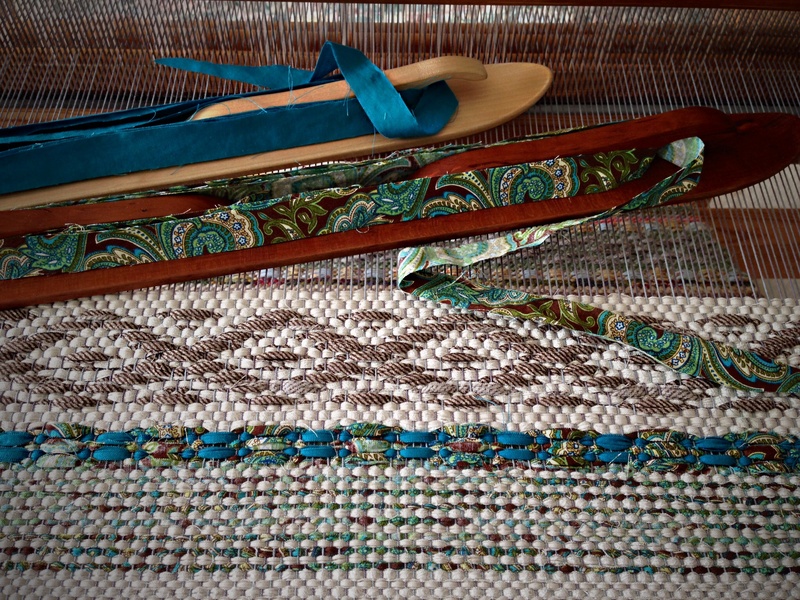 I see what you mean when talking about the two attempts to make the rosepath rug represent you. Sometimes, it is almost like we don’t speak the same language as our work, which makes it difficult to keep going. If we don’t connect with our work, our heart is not in it. And yes, that’s when we need to quit. Your two attempts at this rug also made me think of how different people are and how differently we see things. What doesn’t work for us, works perfectly for someone else. And we may see the beauty in something that others find ugly. Imagine the first attempt at this rug…that all the fabrics as well as the rosepath pattern have a very special meaning to the maker. Anything added or taken away would ruin that experience. Because of the limitations, the focus will shift; the idea of what works will be different; the idea of what is beautiful will change. I love to experience just that, how the circumstances affect my work and also how I feel about the result. Great observations, Elisabeth. Limitations do indeed give boundaries that help creativity thrive. Viewpoint, and even timing, makes a difference in how we see something. There is truth in the saying, “Beauty is in the eye of the beholder.” It is very possible that my own emotional withdrawal from all the wedding activity made it difficult for me to work within the confined boundaries that I started with. Now, I’d like to go back and try using the original colors, perhaps in a slightly different arrangement, to see how I could make it work. I think I needed a little more mental capacity to do that this time. A good word for me today. Thanks!! I write about the things I’m learning, so I’m glad you’re right there with me. This rag rug is not coming out how I expected. The color balance is off. The green and brown do not have enough contrast in the central rosepath design. There is too much red, and it’s overpowering the neutral colors. It is time to call it quits on this one, and get a fresh start on a new rug. If I am going to put my name on something, I want the item to match what is in my mind’s eye. And this is not it! Start of rosepath rag rug. Camera lens helps view the balance of design and color. This short sample will be used to make a bag instead of a floor rug. I like to let my personality show in the items I produce. It would be nice if someone would see one of my rag rug creations and say, “That’s a Karen Isenhower rug!” Not to be famous, mind you, but just to have an identifiable style. A name carries promise. 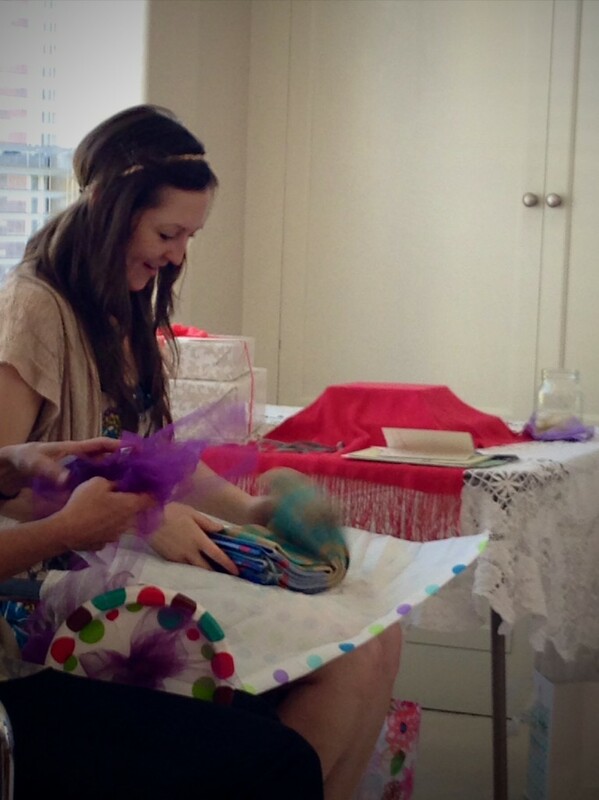 Consistency in the weaving extends the promise and identifies the maker. I’d like my life to be a weaving like that, too, making the fair name of Jesus recognizable. May your creations show what you are like. In case you are not familiar with Claudia Mills’ rag rugs, I will try to give you her website; it’s amazing what she does with log cabin and simple block weaves; the combination of lovely colors and subtlety is so recognizable as hers; a difficult thing to accomplish within the restrictions of a loom. The rosepath rugs you weave are very nice, Karen; keep them posted! Thanks for the link to Claudia Mills. She does beautiful work! I love the way she has developed her own recognizable style. You’re right about the setting making a difference with colors. I can try out various combinations and groupings of thread and fabric strips, but until they are woven together I don’t always know how they will behave. And even when woven, where they are placed makes a difference. Melody smiles when she sees the handwoven towels. She knows her mother’s love is woven into them. “Who gives this woman?” Steve has been practicing his four-word speech for tomorrow, “Her mother and I.” What a privilege that we get to be the ones to give such a cherished gift. And what a thrill to know that we will be on the receiving end, too, as we are given another son. God gives good gifts. He always sends good things and perfect gifts. May you be on the receiving end today.